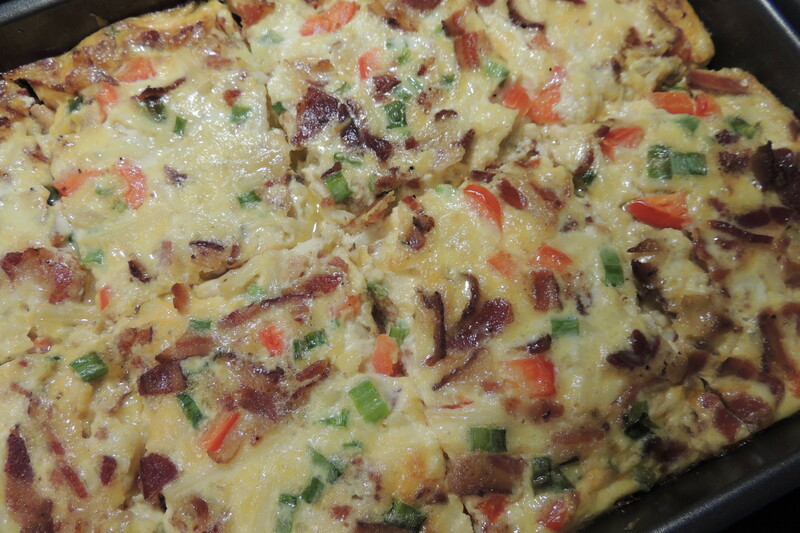 One of the most crowd-pleasing breakfast casseroles I have made, this one is even kid-friendly and can be made with different vegetables according to your family’s tastes. Lately I’ve been using basil & tomatoes, but red peppers & chopped spinach, or any other combination of vegetables will do. The more colorful, the better. You can also subsitute sausage for the bacon. A little time is needed the day before to chop, grate, measure, fry, & mix the ingredients; but in the morning – no worries! Just it pop the oven and serve along with a bowl of fresh fruit and a muffin. Easy-peasy. This version is made in a 9X13 pan and serves 8. One note regarding tomatoes: using grape or cherry tomatoes works best because they don’t produce as much water during baking. Grate, chop, and assemble all ingredients as listed above. Spray 9X13 pan with cooking spray. Layer half of each of the following in this order: cheese, potatoes, bacon, onion, basil, and tomatoes. Repeat layers with remaining half of each ingredient. Mix eggs, half-and-half, milk, pepper, and cayenne. Pour over and top with 2 oz cheese. Cover & refrigerate overnight. In the morning, preheat oven to 325 and bake about one hour until eggs are set and edges are lightly browned. Cut into rectangles and serve immediately. Or, join us at the Inn and I’ll make it for you – then you’ll be ready for that hike up Whiteside Mountain!! Donna & Chris Alley, Innkeepers Since 1984 – That’s right, this is our 32nd Season! !